This park is very popular with Glaswegians and is open daily all year round. At the highest point of the park you can admire Ben Lomond to the North and Tinto Hills to the South. The Forge Market is Scotland’s largest custom built indoor market. There are just fewer than 200 indoor stalls for the avid shopper to browse through. This market is open Thursday to Sunday each week. Early 20th century architect, James Robert Rhind who was an advocate of the baroque style of architecture was commissioned to design Rhind’s Library in Dennistoun. It was completed in 1905 and on its centenary the library was completely refurbished. This museum is dedicated to the world’s different religions. Learn all about the history and current beliefs as well as inspirations of different religions. Tapa is a local haven and offers a bakery, a restaurant and a coffee house to its patrons. Tapa offers hand made organic food and mouth watering cakes and deserts. For the coffee lover enjoy the taste and smell of coffee that has been freshly ground immediately before serving. The Barras is the more affectionate name for Glasgow Barrowland. The name evolved from the early 20th century hire of barrows to traders at the weekend. The Barras is now Scotland’s most famous market. It is open for trading every Saturday and Sunday from 10am to 5pm. Tolbooth, Glasgow Cross The 7 storey steeple is a prominent landmark at Glasgow Cross. It is topped by a clock and stone crown. 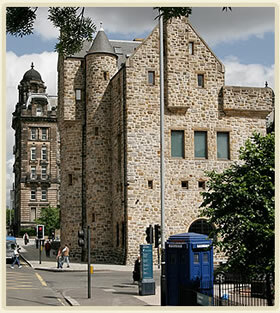 The Tolbooth was built in 1627 to house the council of Glasgow.